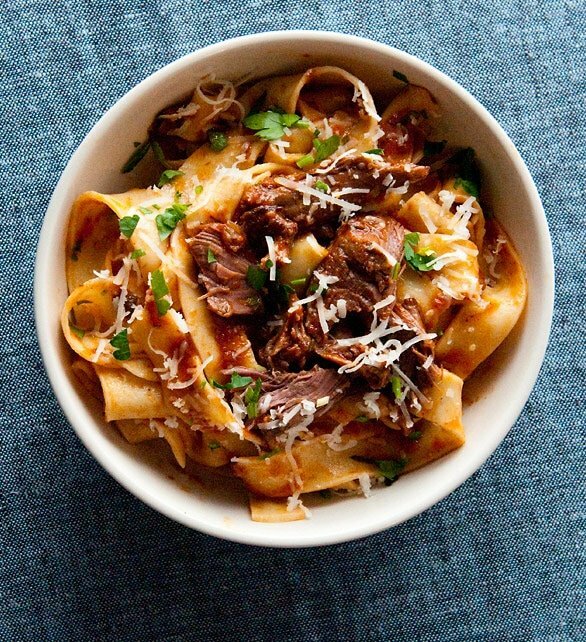 If there were a classic hare recipe, a dish that everyone has eaten, you could make a case for this one: Tuscan hare ragu with fresh pappardelle pasta. The dish is well within the canon of Tuscan cuisine, just as the equally famous civet de lievre is in French cooking. Never heard of that dish? We English speakers call it jugged hare. Hare is not often eaten in the United States. In fact, with the exception of the snowshoe hare in the north country, we don’t even call our native hares by that name: We call them jackrabbits. But make no mistake, a jackrabbit is a hare. What’s the difference? Quite a bit, actually. Photo courtesy Arizona Game & Fish Dept. This is the jackrabbit I made this pasta sauce from. It’s an antelope jackrabbit from the Sonoran Desert south of Tucson, Arizona. The first thing you notice are the ears; way longer than a rabbit’s. Hares also give birth to “precocious” young, meaning they can hop away from danger minutes after birth. Rabbits give birth to helpless little pink things. Hares are larger, smarter, faster — and in the kitchen, tougher — than are any species of rabbit. Jacks are to cottontails what pigeons are to doves, geese are to ducks, elk are to deer. Like the Recipe? Buy the Book! 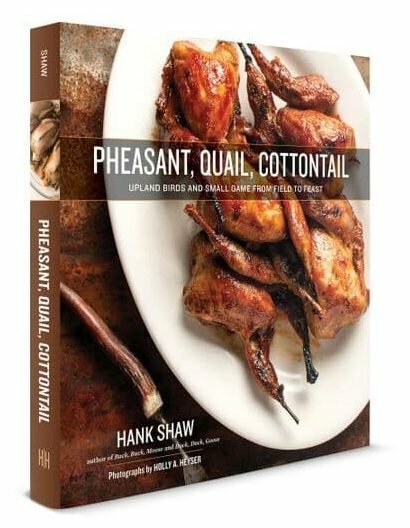 You'll find everything you need to know to master upland game in Hank Shaw's cookbook Pheasant, Quail, Cottontail. Oh, and one more thing, especially important to a cook: Hare meat is rich and dark, like beef or venison. Rabbit meat is white and subtle, like chicken. There are a lot of reasons why Americans don’t eat jackrabbits very much; I wrote about this in detail in 2010. Suffice to say we are still in a Depression hangover, and jackrabbits remain stigmatized as poor people’s food. There is also the issue of parasites, which is real. Botfly larvae in the skin and the occasional tapeworm infestation make cleaning a jackrabbit a bit more of an adventure than cleaning a chicken. But when hunted in cold weather, these problems are rare. So what do you do with jackrabbit meat? Those legs are tricky to work with. They are made up of lots of small muscles, and all those little muscles mean lots of connective tissue, which, in a jackrabbit that can run 50+ miles per hour, can be pretty stout stuff. Braising or stewing is the only way to deal with this. This is precisely why the Italians make this ragu. It is an easy way to deal with little bones and tough muscles. Time and moisture are your friends. 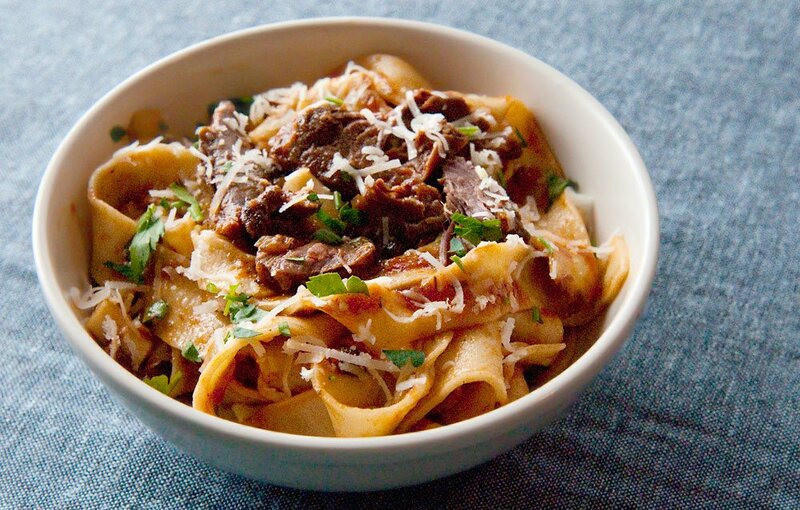 Most classic recipes for hare ragu will have you marinate the meat for up to 2 days in wine, vinegar and herbs. I altered this step by marinating the jackrabbit in buttermilk for 24 hours. Why? The meat smelled strongly of sage, and not in a good way. Buttermilk both tenderizes the meat (it’s the acid) and pulls out a lot of “off” aromas. If your jackrabbit doesn’t smell sagey, you can skip this step. And if you buy a hare, which to my knowledge you can only do online through D’Artagnan, you can just marinate it in wine and herbs as normal. What does this taste like? Well, honestly it tastes a lot like a Bolognese sauce: Meaty, rich, tomatoey without being a true tomato sauce. The hare tastes a lot like well braised lamb and a little of the sauce goes a long way. If you’ve never eaten hare before, this would be a good way to start. This is a pasta sauce specifically designed for hare, or jackrabbit. If you don't have one lying around, don't substitute rabbit -- use a piece of lamb, venison or beef instead. It's a red meat ragu. Nothing else in this recipe is hard to find. 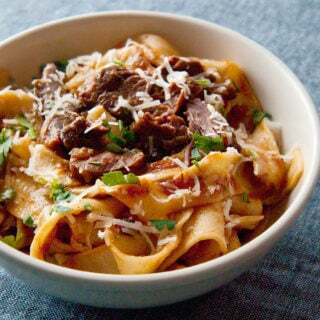 As for pasta, I made my own pappardelle pasta, and you can use any one of my pasta recipes to make your own. Or you can buy fresh pappardelle or just use dried spaghetti. This sauce keeps well in the fridge for a week or so, and can be frozen. If you need to soak the jackrabbit pieces, submerge them in buttermilk overnight. The next day, hack them into large pieces with a cleaver or kitchen shears. This will make them cook faster and fall off the bone easier. Rinse the hare under cold water and pat dry with paper towels. Heat the olive oil in a large Dutch oven over medium-high heat. Brown the hare pieces well. Take your time and do this in batches. Don't let the pieces touch each other as they brown. Salt them as they cook. When browned, set aside. When the meat has been browned, add the onion, carrot and celery and cook, stirring occasionally, until the veggies begin to brown. Add the meat back to the pot, then the sage, rosemary, bay leaves and dried mushrooms. Mix well and allow to cook for a minute. Whisk together the tomato paste and wine and add that to the pot. Add the vinegar. Turn the heat to high to bring everything to a boil, then add the can of crushed tomatoes. Mix well, drop the heat to a bare simmer -- only a few bubbles coming up to the surface -- cover and let this cook until the hare meat wants to fall off the bone, up to 3 1/2 hours. When the meat is tender, fish out the bay leaves and discard. Remove the hare pieces and pull the meat from the bones. Return it to the pot. Ladle out about 1/3 to 1/2 of the sauce and put it into a food mill with a medium grate attached. Alternately, put it into a food processor or blender. Puree, meat and all. If you use a food mill you will have some dry, stringy hare meat left in the mill; discard or feed to your pets. Return the puree to the pot. Serve with pasta of your choice. I serve by putting the pasta in a large bowl, tossing it with a ladle of the sauce, then plating. I top each plate with some more sauce, then some parsley and some grated pecorino cheese. 1) About marinating the legs. For 4 legs I added 1 bottle of red wine, 100 ml of red wine vinegar, 2 bay leaves, some sprigs of fresh thyme, two onions (chopped), I think 5 black peppercorn (smashed), 5 juniper corns (smashed). No garlic. Would that also be your choice ? These ingredients and in these quantities ? 3) You add a 28 ounce can of crushed tomatoes. I like the rich sauce, but I noticed that on most Italian sites they only add some tomato paste. Is this your personal preference or is it based on some Italian recipe ? One last thing …. I really love this recipe !!! 1. Sounds good. Seems a bit heavy on the wine, though. I’d drink a glass before pouring it onto the hare. 2. Because the vegetables won’t add much to the flavor of the hare in the marinade, and I prefer them as-is in the sauce rather than soaked in wine. 3. It’s my personal preference. Either is fine, though. 4. Not sure about this one. Sounds fine though.